Google has improved the way search results show when a user looks for a medication, certain medicine brands, compound or generic names and over-the-counter products. When a user searches a name of a medication, a new and improved version of Google’s Knowledge Graph information box is now seen next to search results. Even though the Knowledge Graph has been showing in search results for a good while, Google has updated its interface to be more attractive and responsive, and health-related content is collected from a wide array of different sources.
? Content that appears in these boxes goes to evolve and is not often consistent or wholly accurate.
? Because of the update, click-through rates could be badly affected by branded product sites for specific search terms. In its press materials for the release of the Knowledge Graph, Google mainly presented the mobile experience, which serves as a primary use for medical information. Additionally, Google’s Knowledge Graph is also an effort to promote and enhance the value of mobile search. After compiling basic fact-rich information, Google collaborated closely with medical professionals in scrutinizing health content and authenticating the information. Apparently, each element that is presented has been studied by several physicians. And with it comes the reworking of Google’s Knowledge Graph. Google also pointed out that some of the information in medical content is not complete, and that the company has taken the understanding that people will delve deeper into the world wide web to acquire more health information. This, in the hopes of users, will be more educated and much able to choose trustworthy information. But then there is still considerable ignorance and unreliable about different health conditions in the United States (ex. Vaccines, HIV, etc). There are also many places in developing countries where people have no access to the human health information. Though medical and health information is not a replacement for real-time medical consultations, this information has the potential to be very helpful to many people globally. Others might conclude that Google is going into yet another massive content area, and taking advantage of the opportunity against third-party publishers. This is not the case, though --- Google looks mainly motivated to provide higher-quality medical information and educate users properly. In order to be presented with Google’s Knowledge Graph -- be it original or refurbished in results, searches must have only the medications’ generic or brand name in the search box, not including other words. For example, “Ibuprofen” can show results in the Knowledge Graph box. Searches like “Ibuprofen dosing” or “can Ibuprofen be taken with other medicines” or “Ibuprofen adverse effects” do not. Another important difference between results shown for a medical condition Knowledge Graph box against those that appear for a medication is a content source, which can be seen below the box at right. All content for health conditions is collected, curated and verified accordingly by a team of doctors. However, it shows that health content for the refurbished medication Knowledge Graph is collected from Mayo Clinic, DailyMed, U.S. Food and Drug Administration, U.S. National Library of Medicine and other sites where health information is easily accessible by many users. Google’s Knowledge Graph feedback box is situated in the bottom-right corner for reporting issues with content. There is also the “More about this information” drop-down link which can be clicked if the feedback option is missing. It also features an option to request the content to be removed based on legal grounds. While many Google users are adept at submitting feedback, employees working in pharmaceutical companies are encouraged to strictly follow protocol in correcting any discrepancies and incompleteness of medical information on the Web. 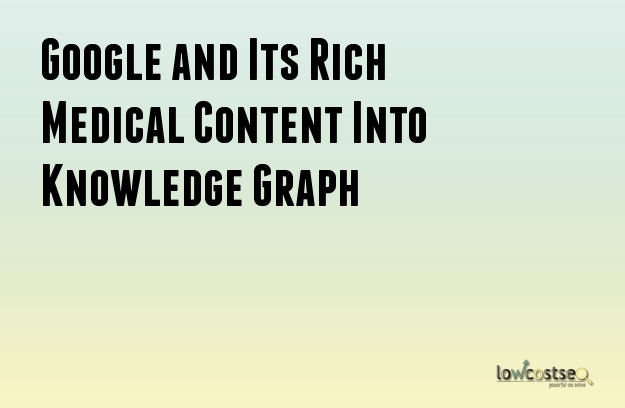 Because one in twenty searches on Google is for medical-related information, a lot of people assume that the Knowledge Graph is Google’s continuous effort to acquire and keep the vast volume of medical-related queries on Google-related features. If a healthcare company, for example, is verifying the spelling of the generic name for a branded medication, the box will show them what they need to know without redirecting them to a branded site. As the refurbished Knowledge Graph is improved to be more responsive and aesthetically attractive, Intouch studied whether the change was decreasing organic click-thru rates in the search results. They analyzed twenty-five brands across different healthcare companies and calculated the new medication Knowledge Graph lessened organic click-thru rates to the websites by just over two percent on average. While the analysis is not statistically important, Intouch is reasonably assured in its conclusion: The new Knowledge Graph has a few negative effects on organic traffic. It is probable that PPC or pay-per-click is also similarly affected. Every healthcare brand should take an in-depth study in their Knowledge Graph results to learn what content shows in search results. This is on account of the myriad of concerns about the responsibility of healthcare companies to rectify misleading information found on the web. Discernment and sound judgment should be practiced, following the healthcare company’s imposed standard operating procedures. Sending feedback to the health care provider or to Google does not promise they will make immediate alterations, but it can increase the chance of doing so. That being said, content that was corrected for Google’s Knowledge Graph, audits should be performed regularly to ensure accuracy. Although Google’s Knowledge Graph boxes may have minimal negative effects on website traffic on account of generic and branded names are triggering them, Intouch suggests looking out and seizing opportunities to improve for long-tail branded traffic, ex., “can Aspirin be taken with other medicines”. Long-tail keywords are described as any search queries comprising of three or more words. In general, they have more distinguishable search intent, easier to rank organically, and are looked up for only a few times.